In today’s competitive professional landscape, it is essential that you keep up with the latest trends in your field. Pursuing both certifications and certificates can help enhance your credibility within the industry, boost your salary, and possibly open up better job opportunities. 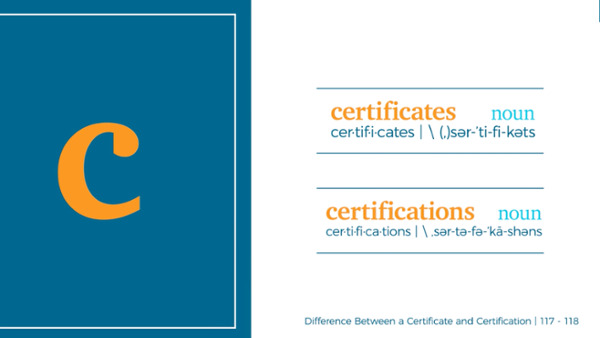 But how do you know whether a certification or a certificate is right for you? The key is understanding the differences between the two and pinpointing which one will help you achieve your professional goals. In many industries, a professional certification signifies that an individual has demonstrated a sufficient or higher level of training in a specific subject matter. For example, Project Managers can attain the Project Management Professional (PMP) certification, and in doing so, they can meet various qualification levels in their respective fields. Certifications can also help individuals meet continuing education requirements. They offer credentials from professional groups. They typically require experience and passing some type of exam. They offer designations to use after your name. Whether needing to learn new skills or adapting to changes in their industries, individuals can stay ahead of the game by pursuing certificates. Certificates allow workers to expand their knowledge and skills in a certain area without having to enroll in a comprehensive educational program. For example, an individual who earned his/her marketing degree ten years ago may be ready to learn about newer marketing practices like PPC or SEO. Earning a certificate through an online Marketing Certificate course will allow the individual to learn about these new principles without having to go back to school full-time. They are essentially training programs to learn new skills. They reward participants with a certificate of completion. They compliment your professional experience. Whether you want to become an “expert” in your field through certification or are looking for ways to expand your knowledge and skills by earning certificates, both options will add value to your resume and help you future-proof your career.